Make your Visita Iglesia this week a journey not just of faith but also of heritage by choosing to visit the centuries-old Spanish period churches that are common across the island of Cebu. For your list of seven churches to visit this Holy Week, check out these places of worship in Metro Cebu that have played crucial roles in the island’s conversion to Christianity. This towering structure, known as the church of the miraculous Señor Santo Niño de Cebu, blends Baroque, Muslim, and Romanesque architectural influences. Cebu’s oldest church, given the honorific title “Basilica Minore” in 1965, retains some of the original stone texture and natural color it had in its 1730 construction. Located right in the heart of downtown Cebu City, the Basilica Minore del Sto. Niño started out as a church of light materials established back in the mid-1500s, probably by Fr. Diego de Herrera, said Balaanong Bahandi, a book on the Sacred Treasures of the Archdiocese of Cebu. When this early structure was destroyed by fire in 1566, another one was built to replace it in 1571. Ten years after that, the foundation of the first stone building, which took 27 years to finish only to be reduced to ashes on May 8, 1628, was laid. Balaanong Bahandi credits the present coral stone church to the efforts of Fray Jose Bosqued in 1730, although its construction had to be stopped for lack of materials and was completed only in 1739 during the term of Fray Juan de Albarran. On January 16, 1740, the Sto. Niño image was enthroned in the newly completed Augustinian church which is built on the same spot where it was found by Miguel Lopez de Legazpi and his men in 1565. It is widely believed that the Santo Niño image is the same one given by Portuguese explorer Ferdinand Magellan to Queen Juana of Cebu in 1521, that same year when she, her husband Datu Humabon, and several of their followers were baptized into the Roman Catholic faith. It is a fitting ecclesiastical seat of the Archdiocese of Cebu. It didn’t always look this way, though. In 1665, when Fray Juan Lopez took over, and up to 1741, there was still no decent church, only a tabique barn covered with palm leaves, said Mojares, adding that one was substantially finished in 1786 but by 1829 it was in ruins. According to the Balaanong Bahandi, a stone church was successfully completed during the latter part of first Cebuano Bishop Juan Bautista Gorordo’s term from 1862 to 1934. 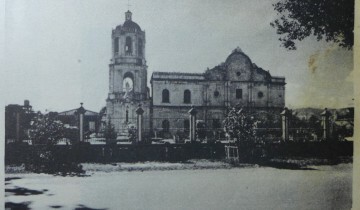 This structure was renovated by Gorordo’s successor, Archbishop Gabriel Reyes, and consecrated in 1940 but it was destroyed by American bombings during World War II and all that remained of it was the facade. When Cebu Archbishop emeritus Ricardo Cardinal Vidal was appointed parish priest of the Cathedral in 1981, it was already the current structure minus the two side extensions. He had both added in the 1990s as Cebu was preparing to celebrate its 400th anniversary as a diocese in 1995. Built sometime in the 1920s during the time of Fr. Valeriano Cabantan, the Mabolo church’s original design was neo-Gothic. Even today, after some remodeling and expansion works on the structure, one can still see neo-Gothic influences in the pointed arches of the bell tower, the only untouched part of this 20th century architectural jewel, according to the Cebu Archdiocese book Balaanong Bahandi. Citing works by Fr. Pedro Galende and Felipe Redondo, Balaanong Bahandi said that Mabolo was first founded as Talamban in 1600, by workers of an Augustinian friar estate called Banilad who built there a chapel dedicated to St. Joseph. Though not yet a parish, it kept burial and baptismal records and by 1792 had its own priest to minister to the needs of the townsfolk. This town of Talamban, as Mabolo used to be called, became a parish on April 3, 1850, through Royal Approval of December 9, 1847, wrote Redondo in his book Breve Reseña. According to Galende, it was also between 1847 and 1850 that the town center of old Talamban was relocated to its current site and a new church of stone and wood built on an area that we now know as Mabolo. Fr. Manuel Ybeas had a parish house of cut coral stones at the first level and wood at the second level built just a few meters from the church. While the first church had been destroyed by natural calamities, the rectory still stands today. Designed by a Spanish engineer-architect, the church of Pardo is probably the only one of its kind in Cebu that is of Byzantine influence. Domingo de Escondrillas was commissioned to design the church by Fray Manuel Ybeas, who was parish priest from 1873 to 1893. He chose a Byzantine style for the structure because he wanted it distinct from other churches, explained Fr. Pedro Galende in his book Philippine Church Facades, as cited in Balaanong Bahandi. The church is located on the national highway in Pardo. Old photo of the Pardo church posted in Skyscraper City. Whereas other Cebu churches built during the Spanish period are wider than they are tall, the Santo Tomas de Villanueva Parish Church rises from the ground up, an imposing fortress. The structure’s belfry is located in the middle of its facade, unlike many other churches in Cebu, and is flanked by two cylindrical towers that are not as high. Pardo or El Pardo started out as a visita of San Nicolas that was separated into an independent parish on April 10, 1866, Felipe Redondo wrote in a book published in 1886. Galende, another church writer, said Pardo was once a town formed by the merger of Bulacao, Inayawan, and Basak through a decree of the Governor General on March 10, 1863. It is now a barangay of Cebu City officially known as Poblacion Pardo. The National Shrine of San Jose is a fairly new structure but the religious formation of the area that is now Mandaue City can be traced to as far back as the late 1500s. Augustinian missionaries, according to the book Balaanong Bahandi, were the first to minister to the people of Mandaue but handed this task over to the Jesuits in 1599. A report in 1789 described the Mandaue City church, a construction attributed to the Jesuits, as sufficiently deteriorated, and the Augustinian writers Manuel Buzeta and Felipe Bravo wrote that the structure was of mediana fabrica or mixed fabric and served by a regular priest. A strong earthquake damaged the church in 1922 and repairs were only completed in 1936. Another round of destruction, according to the Cebu Archdiocese’s book, happened during World War II and the life-sized statues that memorialized the Ultima Cena (Our Lord’s Supper) were also destroyed. Post war-repairs of the structure were undertaken through the efforts of Fr. Manuel Yap, who also blessed the new tableau of the Ultima Cena that Fr. Cesar Alcoseba commissioned to replace the ancient statues. The statues are among the church’s attractions. Mandaue City’s current church underwent a major renovation in 1998, which involved removing the huge pillars at the crossing that used to support the roof to provide more space. Since the devotion to her started in Africa, this church’s patron – the Patroness of the Rule of St. Augustine – has been depicted as dark-skinned. Lucy Urgello Miller, in “Glimpses of Old Cebu: Images of the Colonial Era,” wrote that this church’s first parish priest way back in 1735 brought with him an original painting of the Nuestra Señora Virgen de la Regla from Africa. The priest – Augustinian friar Francis Avalle – used this painting to teach people about her and as basis for the religious icon of the Patroness of the Rule that he commissioned also in 1735. She was named Virgen de la Regla, which means Lady of the Rule, because St. Augustine dedicated to her the reglas or rules he created for members of his order to follow. Both objects are housed at a special room at the back of the church where devotees line up to kiss or touch the Virgen as part of a “panaad” or devotion. Devotees usually come in throngs during the Lapu-Lapu City fiesta on November 21 or days leading up to or after this date. Miller described this church, built between 1735 and 1744, as having a pathway of coral blocks that led to the sea during the early days. Originally built from coral blocks, this church was damaged but not badly during World War II and repairs brought it back to its original condition. It would have been among the oldest churches in the country if Dutch priests assigned there in 1960 had not decided to tear it down and build a new one in its place. Opon started out as a visita of San Nicolas and was elevated to parish status in the 1730’s. Two differences set the San Ferando Rey Church in Liloan from other houses of worship built in Cebu during the Spanish period. It faces the mountains instead of the sea and was built bigger than similar structures of its kind. The Liloan Church was named after St. Ferdinand, who was king of Spain from 1217 to 1252. From being a barrio of Mandaue, Liloan was turned into a new parish on June 27, 1845, according to the Archdiocese of Cebu book Balaanong Bahandi, citing church historian Felipe Redondo. Liloan, already a town by then, was prepared for the development as residents had already built a temporary church and rectory. The town already had close to a thousand houses and was ruled by a gobernadorcillo around this time, the book added. The first parish priest was Augustinian Recollect Fray Vicente Dolores.